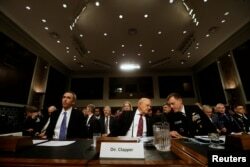 Director of National Intelligence James Clapper listens at left as National Security Agency and Cyber Command chief Adm. Michael Rogers testifies before the Senate Armed Services Committee hearing on Jan. 5, 2017. United States intelligence leaders say they believe high-level Russian officials were directly responsible for attacking American computers during the 2016 election campaign. The intelligence leaders met with a U.S. Senate Committee in Washington Thursday. They said that Russia hacked the computers and released documents from the Democratic National Committee (DNC) in an effort to interfere in the presidential election. Only “Russia's senior-most officials could have authorized the recent election-focused data thefts and disclosures,” they said in a prepared statement. Senate Armed Services Committee hearing on foreign cyber threats, Jan. 5, 2017. The U.S. leaders are Director of National Intelligence James Clapper, National Security Agency chief Michael Rogers and Undersecretary of Defense for Intelligence Marcel Lettre. They called Russian cyber-attacks a "major threat" to national interests. Clapper said there is no evidence that Russia actually changed any vote counts. He said the intelligence agencies are unable to say how the information might have changed any American minds or votes. Arizona’s John McCain, chairman of the Senate Armed Services Committee, told the hearing that “every American should be alarmed” by Russia’s actions. He added that “Congress must set partisanship aside” in investigating and preventing cyber-attacks on America. U.S. intelligence agencies have said they have evidence that Russia hacked the emails of Democratic Party officials. Critics say the hacking was meant to help Donald Trump, the candidate of the Republican Party, win the presidential election. President-elect Donald Trump speaks to reporters at Mar-a-Lago in Palm Beach, Fla. But President-elect Donald Trump has questioned those claims. On Thursday, President Barack Obama received a report on the investigation he ordered into the possible foreign interference in the election. Trump is expected to receive the same information in a briefing in New York City on Friday. 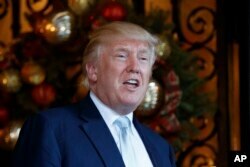 The president-elect has questioned reports that Russia interfered in the vote. He took to Twitter late Tuesday, taking aim at the intelligence agencies. Trump suggested they still do not have proof that Russia broke into the DNC’s computers and gave the documents to the WikiLeaks website. Can Julian Assange Be Trusted? WikiLeaks founder Julian Assange has denied that the Russian government gave his group stolen documents. He appeared on Fox News television earlier this week. Trump was talking about thousands of emails and documents that hackers took from the DNC’s computers and from John Podesta, the chief of Hillary Clinton’s election campaign. Clapper and other intelligence officials told the Senate committee Thursday that they put no credibility into what Assange says. Ukrainian political scientist Lilia Shevtsova is an expert on Russian government. She told VOA that some foreign policy experts in Russia are calling for increased communication between it and the United States. She said Obama moved toward such a policy in 2008 when Dmitry Medvedev was Russia’s president. But she said the effort failed. Shevtsova said Russian experts continue to call for increased communication. Valery Garbuzov is the director of the Russian Academy of Sciences’ Institute for U.S. and Canadian Studies. He told VOA that many Russians are hopeful that Trump’s presidency will lead to improved relations between the two countries. Garbuzov said he is not sure Trump will be able to quickly improve U.S. relations with Russia. Anne Ball wrote this story for VOANews.com. Her story was based on reports from VOANews.com, the Associated Press and Reuters. George Grow was the editor. reliance – n. the state of needing someone or something for help, support, etc.